The tracks listed as I1 and I2 are to be considered one track, as they are not only listed AS one track on the label, but plays as one track on the vinyl. NO CUE BAND between tracks. Has anyone compared the sound quality of this release to the 7" limited edition? 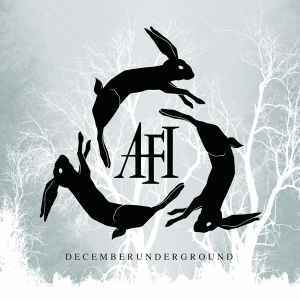 AFI's Decemberunderground is in my opinion one of their best albums. It takes element from there previous hardcorepunk sound and blended it with a new alternative rock sound. In effect they have a distinct and signature sound with this album. Sadly they often change their sound a bit album to album. However that only Makes Decemberunderground all the more original and distinct. It is a very artistic album and Davey Havoks high vocal range makes this a beautiful album. The lyrics are very thought provoking and artistic. The songs are all very good and very memorable. Not a poor song in the album. Listening to each song creates in you all kinds of images and takes you many places in life and soul.